IP paquets contain multiple fields, among which the destination and source addresses. 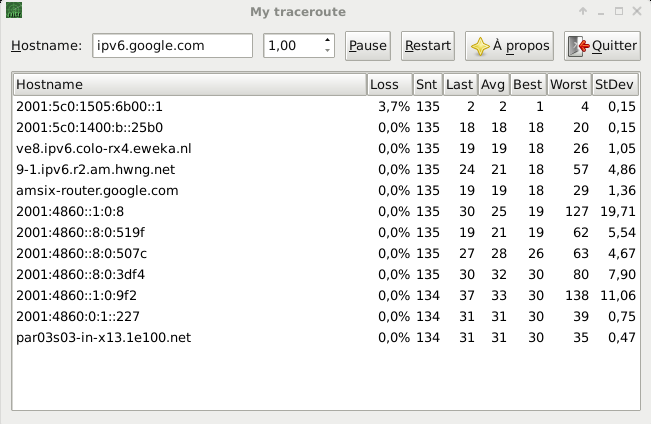 Traditionnally, packets are routed by looking at the destination only. Source-specific routing is a routing technique that takes the source of a packet into account in addition to the destination. 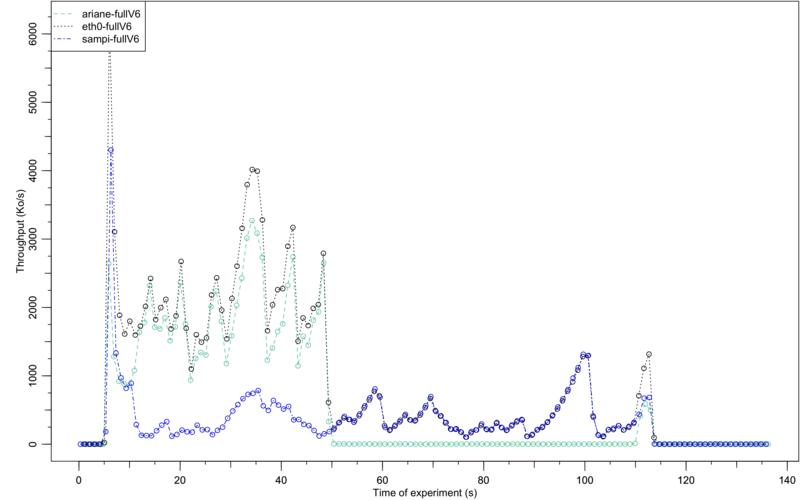 Our testbed at PPS is a double-homed IPv6 network. It is connected to the OVH network and to the freenet6 tunnel broker. The two traces below were obtained on the same machine, at the same time. Multipath TCP needs source-specific routing, which can be done by hand, as explained here. If we look carefully at their solution, we see it is exactly what makes automatically babeld. There is no need to setup hosts, but only gateways, to indicate babeld with which source prefix are redistributed the default routes (see the configuration part). 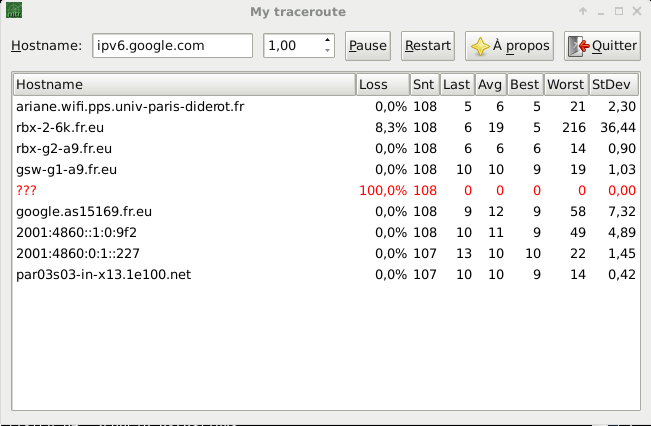 The "fullV6" graphs are graphs obtained when the v4 default route is removed (I just let routes for VPNs). In these cases, the "--bind-address" option is needed, because otherwise the kernel consider the IPv6 hosts as unreachable. 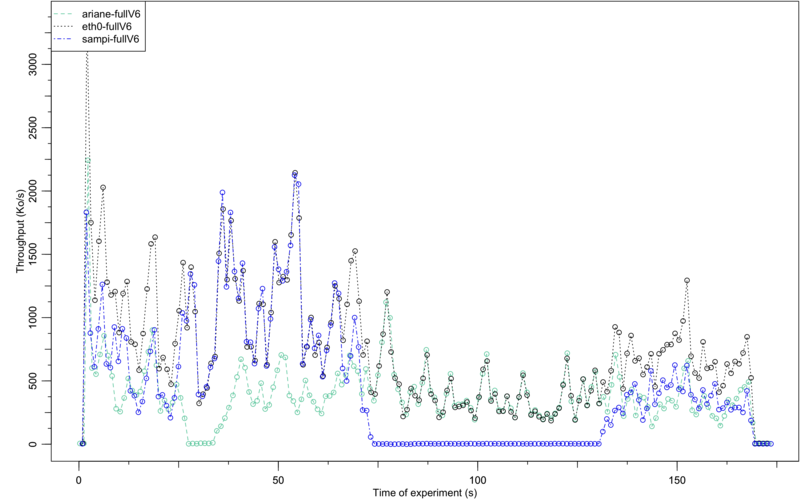 Finally, on these graphs, we can sometimes see the throughput of one or the other of the interface going down: this is when I stop the babel routing daemon on one or the other of the gateways. 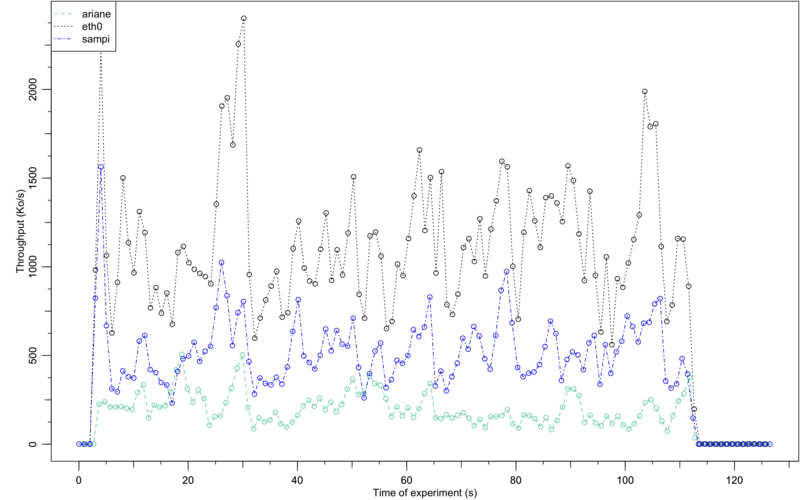 In this case, the source-specific route is no more distributed, and as expected, the traffic goes down. Throughput is measured with this script: throughput.sh. The network looks like: A --- VPNs --- B --- VPNs --- C.
Here are the routing tables. I just collapse the /128 addresses, which are duplicated in each routing table, since they are redistributed with a default source prefix.